Thomas Kelso was appointed Chairman of the Maryland Stadium Authority by Governor Larry Hogan, Jr. in March 2015. Mr. Kelso is a Managing Director, Head of Downstream Energy & Retail Group, Chief Compliance Officer as well as Head of the Baltimore Office of Matrix Capital Markets Group, Inc., a leading mid-market independent investment bank. Mr. Kelso leads a highly recognized team that provides advisory services to companies engaged in the petroleum marketing and distribution industries nationwide. Mr. Kelso is a FINRA licensed registered representative and holds Series 79, 63, 24 & 99 securities licenses. 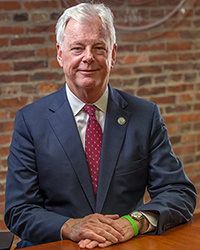 Prior to joining Matrix, he previously consulted with clients on mergers and acquisitions, corporate restructuring and refinancing, primarily within the petroleum industry, at Kennilworth Holdings, Inc. and was the co-founder and CFO of Ocean Petroleum Co., Inc.
Mr. Kelso has been engaged in many aspects of education, serving as Business Officer for the Evening College & Summer Session division at Johns Hopkins University to serving on the Board of Trustees, and as Chairman, of his alma mater, John Carroll School in Bel Air. Mr. Kelso is the chair of the "Lighting the Way" Capital Campaign for John Carroll. Mr. Kelso was previously on the Board of Directors of the Maryland Public Policy Institute and served as its Chairman from 2009-2013. Mr. Kelso and his wife, Dori Bishop, founded the Kelso Bishop Family Foundation to pursue their philanthropic efforts. A native Marylander, Mr. Kelso and his wife now live in the City of Baltimore.